When we think of bird life in New York, our minds usually wander to pesky pigeons, but there are actually 355 different species of wild birds who call the city home. A good number (pigeons, mourning doves, and mallard ducks, to name a few) are full-time residents, but there are also many who have the ultimate pied-a-terres, flying north to nest and raise babies in the spring or migrating south from the Arctic for the slightly warmer New York winters. For years, if these birds were injured or sick, there was little help available, but everything changed when Rita McMahon became involved in the rehabilitation of wild birds in 2002. 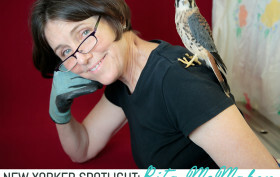 What began for her as caring for pigeons and sparrows as a rehabber, progressively grew into a calling and eventually a career. Through the support and encouragement of the veterinarians at Animal General on the Upper West Side, she co-founded and became the director of the Wild Bird Fund in 2005, which was then located in her apartment. In 2012, the organization opened its own facility on the Upper West Side and last year treated approximately 3,500 birds. 6sqft recently spoke with Rita to learn more about New York’s wild birds, how the Wild Bird Fund helps them, and ways New Yorkers can be more attuned to their avian neighbors.